To pick the 100 Best Companies to Work For, Fortune partners with the Great Place to Work Institute to conduct the most extensive employee survey in corporate America; 280 firms participated in this year's survey. More than 246,000 employees at those companies responded to a survey created by the institute, a global research and consulting firm operating in 45 countries around the world. Two-thirds of a company's score is based on the results of the institute's Trust Index survey, which is sent to a random sample of employees from each company. The survey asks questions related to their attitudes about management's credibility, job satisfaction, and camaraderie. The other third is based on responses to the institute's Culture Audit, which includes detailed questions about pay and benefit programs and a series of open-ended questions about hiring practices, methods of internal communication, training, recognition programs, and diversity efforts. After evaluations are completed, if news about a company comes to light that may significantly damage employees' faith in management, we may exclude it from the list. Any company that is at least five years old and has more than 1,000 U.S. employees is eligible. The deadline for applying for next year's list is July 1, 2012. For an online nomination form, go to the Great Place to Work Institute�s web site. 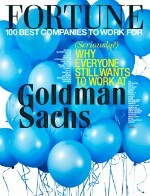 If you have further questions about the Best Companies to Work For, please e-mail fortunespecials@fortune.com.